We’d love your help. 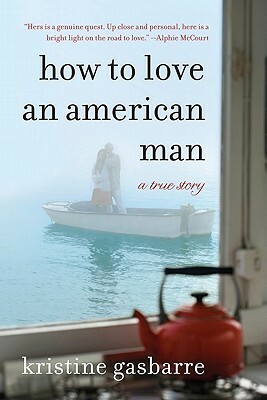 Let us know what’s wrong with this preview of How to Love an American Man by Kristine Gasbarre. A lovely, warm, and poignant true story that reads like compelling fiction, How to Love an American Man is Kristine Gasbarre’s unforgettable memoir recalling the valuable lessons on love she learned from her newly widowed grandmother—and how Grandma’s advice and memories enabled the author to find and fall for a man with an old-fashioned approach to romance. Fans of Elizab A lovely, warm, and poignant true story that reads like compelling fiction, How to Love an American Man is Kristine Gasbarre’s unforgettable memoir recalling the valuable lessons on love she learned from her newly widowed grandmother—and how Grandma’s advice and memories enabled the author to find and fall for a man with an old-fashioned approach to romance. Fans of Elizabeth Gilbert’s Eat, Pray, Love, women readers drawn to tales of powerful female bonding, and anyone looking for a beautiful love story will be moved and, perhaps, profoundly inspired by How to Love an American Man. To ask other readers questions about How to Love an American Man, please sign up. First, a little background. I have to admit - when I first saw the title of this book, I didn't have much of a desire to read it. And that was before I even read the synopsis! Have you ever done that? Have you made a snap judgment about a book just based on the title alone? Trust me, I will never make that mistake again! After reading Meg's review (from Write Meg), I knew, without a shadow of a doubt, that I had to read this book. Meg is one of my favorite book bloggers and From my blog . After reading Meg's review (from Write Meg), I knew, without a shadow of a doubt, that I had to read this book. Meg is one of my favorite book bloggers and her glowing review of this book sealed the deal. I got over my dislike of the title when I saw that the book was on a TLC Book Tour. I jumped at the chance to review it. This book is a hidden gem. It is one of those rare finds in the publishing world that just makes you stop in your tracks and think, "Yes! This is why I love to read." Krissy is honest and forthright, giving all of herself in pursuit of Mr. Right, but never quite figuring out what she's supposed to be doing. So, she makes a life altering decision to move to Italy to rediscover herself and to learn more about her beloved grandfather and where he grew up. There is one main love interest through the course of the novel, Dr. Christopher. There are many ups and downs as Krissy and Chris try to figure each other out. It was hard to know where the relationship would end up (and where I wanted it to end up, to be honest!). I will admit that I had moments of screaming at the book ("Krissy, just tell him how you feel already! "; "Chris, just DO something!"). They are two strong characters and neither one of them wanted to put themselves out there to be hurt. I can understand that. The whole back-and-forth between them was agonizing at times, though. However, these quibbles are minor. This novel is exquisite. It contains so much beauty and wisdom. It should definitely go on your must-read list. I can't wait to pass it along to my mom and grandma and others in my family. I highly recommend this memoir. Every now and then a book comes along where the premise sounds so good that you feel like you MUST read the book. In this case, the book in question was How to Love an American Man by Kristine Gasbarre and I’d requested it as my monthly book to review and eagerly waited for it in the mail. I couldn’t wait to read what I was certain was going to be an amazing story of intergenerational lessons, story-telling and romance. I was wrong. This isn’t going to be one of those book reviews where I Oh Dear. I was wrong. This isn’t going to be one of those book reviews where I get a lovely note from the author expressing gratitude for my review. Unfortunately, I don’t have many kind words this go-round. Frankly, the bottom line is that Ms. Gasbarre had an amazing story to tell, but her writing style is elementary and, at times, boring to read. With what she had to work with, this book could have been ten times what it was and I was disappointed for her. The book felt like it was written in a rush and sometimes you want food from a crockpot, not a microwave. The storyline is that the author loses her grandfather and this starts a chain reaction of discovering who she is through her relationship with her newly widowed grandmother. Seeking advice from a grieving widow about relationships has much to offer as both people in the story were grieving and there was much information that was rich for the picking in a literary sense. At the end, however, I felt like Krissy, as a person, was immature and unlikable with the way she portrayed herself. Her inability to adequately portray emotions concerns me over her choice of profession as a writer, especially when she compares her first feelings in a relationship to that of two actors in a well known vampire movie series. Seriously? Was that really the best reference she had for a relationship? The book has plenty of pop culture references that are geared towards 20 year olds, not 28 year old women who are in the midst of trying to find themselves. Unfortunately, for Ms. Gasbarre, 20 year olds are not going to be her target audience. They aren’t going to be interested in “How to Love an American Man.” At the age of 20, most 20-year olds think they’ve got it all figured out. It isn’t until later that we’ve realized that we have no idea. My understanding is that Ms. Gasbarre is writing a sequel. If I didn’t need to finish the first one to write this review, I would have stopped reading it about 1/4 of the way into the book, if I’m being perfectly honest with myself and with you. I will not be reading the sequel. I will not be passing this book on to my mom or friends to read. I just don’t care how the story ends…and that makes me sad. This book is a miss. Sidenote: On every site that I posted my review, and in droves, people came in and bullied me about my negative review of this novel. This happened until I called the author out on Twitter and noted that the language in the bullying was extremely similar to the writing in her novel and just as immature. Be aware that the author's friends/publisher's are likely stacking the ratings on this one. I normally wouldn't bother mentioning this stuff, but it was such shoddy practice and left me with such a bad taste in my mouth about reviewing books that I feel like I need to get it out there and just let it go. I've had authors be upset with what I had to say about their books. I've never had them send the dogs out for me. It's not ok. Either you can deal with the criticism or you can't. Kristine Gasbarre’s How To Love An American Man is a book that emotionally socked me in the stomach in a way that few books ever have. Gasbarre’s true look at her grandparents’ marriage -- and what may have gone awry in her own love life -- was emotionally wrenching and unique. In a word, I found this book invigorating. It’s not about a dysfunctional family, for one. Krissy has no qualms about spending the day with her grandmother, escorting her to doctor’s appointments before they sit down to ta Kristine Gasbarre’s How To Love An American Man is a book that emotionally socked me in the stomach in a way that few books ever have. Gasbarre’s true look at her grandparents’ marriage -- and what may have gone awry in her own love life -- was emotionally wrenching and unique. In a word, I found this book invigorating. It’s not about a dysfunctional family, for one. Krissy has no qualms about spending the day with her grandmother, escorting her to doctor’s appointments before they sit down to talk about Kris’ plans and fears. As someone who is also close to my grandparents, I saw shades of my own relationship with my grandmothers in Gloria and Krissy’s chats. And it’s so rare to read about a happy family, isn’t it? The Gasbarre clan not only works but flourishes, leaning on one another through everything. It was heartwarming. How To Love An American Man is framed around Gloria’s advice on becoming a strong, independent and worthwhile woman, and it’s not just about finding a husband (though she would certainly wish that for her granddaughter). Gloria is the scene-stealer in every chapter, doling out words of wisdom on marriages as partnerships and being the sort of woman you would be proud to know yourself. I loved that Krissy took her grandma seriously, treasuring her thoughts -- and I also loved that, despite the somber tone echoing the Gasbarre family’s grief over losing their patriarch, the memoir never becomes maudlin. On the contrary: it feels upbeat. And hopeful. And like, no matter what happens, Krissy will be able to savor the time she’s spent with her loved ones and become a better person for it. She certainly seems to have evolved from start to close, and that’s something I crave in my reading life: lessons learned. Oh, yes -- and there’s the love interest. Several, actually, but the most prominent would be Dr. Christopher, a local MD who dates Krissy briefly before hiring her instead. The whole will-they-or-won’t-they vibe, which was electric, had me craving to know the outcome . . . even though I wasn’t sure I would be pleased with the end result. Though self-centered, Chris did seem like a decent man -- and I wanted him to be It for Krissy. Their relationship seemed well-drawn and realistic. This "book" is a sign that our society is in great decline for 2 reasons: one, it was published - how and why I cannot fathom. The second reason is that there are people who actually positively reviewed this book. This is the worst piece of junk ever to lay before my eyes. The description made it seem interesting but that's the only good thing about it. Immature, badly written and overall just awful. I couldn't stand Ms. Gasbarre! What a super annoying, self-absorbed woman! Oh, I must admit there This "book" is a sign that our society is in great decline for 2 reasons: one, it was published - how and why I cannot fathom. The second reason is that there are people who actually positively reviewed this book. This is the worst piece of junk ever to lay before my eyes. The description made it seem interesting but that's the only good thing about it. Immature, badly written and overall just awful. I couldn't stand Ms. Gasbarre! What a super annoying, self-absorbed woman! I'm really not sure what to make of this book. It's a stereotypical rom-com and I was hoping that the family history and advice from her grandmother would play a larger role than it did. I hated Dr. Chris and Tucker and wish that Kristine wasn't mooning over them so much. I had to keep reminding myself that she is only 28 in this book and I'm considerably older, which means that I have learned all of these lessons already. Still, I'm going through a rough patch. I've recently moved to a new city I'm really not sure what to make of this book. It's a stereotypical rom-com and I was hoping that the family history and advice from her grandmother would play a larger role than it did. I hated Dr. Chris and Tucker and wish that Kristine wasn't mooning over them so much. I had to keep reminding myself that she is only 28 in this book and I'm considerably older, which means that I have learned all of these lessons already. Still, I'm going through a rough patch. I've recently moved to a new city and I'm trying to find a job (read: getting lots of rejection), all while dating someone that I'm pretty ambivalent about...but I continue to date because I don't have much else going on. So the chapters entitled Get Your Life Settled and You Are the Prize were nice little reminders for me. "I’d forgotten this culture existed; this comfortable world where friends are so loyal that decorating for the wedding of a friend’s daughter is as much a bustling community effort as an episode of something Ty Pennington would host. These women’s beauty radiates not after spa day, like it did for me in New York, not from the glamarazzi fashion sense I grew to worship in Italy, but in their down-to-earth sharing with each other— and now, with me." All in all it wasn't a horrible read, but I wouldn't really recommend it to anyone either. In fact, I'm a little embarrassed to write this review. While this is a memoir, I really didn't like Krissy. I didn't care about her. Her time in Italy was almost written as an aftert I have really mixed feelings about this book and how to write the review.. The synopsis and premise for this memoir sounded enthralling and I was anxious to read it, imagining a rich story of maternal family relationships. Instead, it was shallow and self-serving. This book is poorly written, and felt like one way too long blog post. Every person/character is the story is written in a worshipful tone, even if she does occasionally mention that the person does have a couple flaws. While I'm sure she loves her family very much, this shows a lack of ability to analyze people and characters to make them compelling - it also makes the book boring and frustrating and difficult to get through. Her relationship with her grandmother is somewhat compelling, but the This book is poorly written, and felt like one way too long blog post. Every person/character is the story is written in a worshipful tone, even if she does occasionally mention that the person does have a couple flaws. While I'm sure she loves her family very much, this shows a lack of ability to analyze people and characters to make them compelling - it also makes the book boring and frustrating and difficult to get through. Her relationship with her grandmother is somewhat compelling, but the book is so self-absorbed, that relationship seems to be mostly about the author's development, rather than about the relationship they develop. Not surprisingly, the men she pursues are not fully developed either, and her writing did not make me want her to fall in love with either of them. I wish she would have gone more fully into her development as a person - it sounds like she really grew into an adult during the time this story takes place, but the writing doesn't make that clear; in addition, given that several reviewers have referred to an upcoming sequel, I'm wondering if she cut off the story in order to be able to write the sequel, leading to a feeling of an unfinished book for this story. A beautiful and refreshing look at life, love, marriage, dating and singleness from the wisdom and experience of a grandmother to the ears of her granddaughter. It's not another one of those modern, jaded books on dating. Really sweet and fun. Maybe the secret to fulfillment is to stop wondering what we're lacking; to stop seeking love and instead to start accepting ourselves and loving the people we encounter. This is what it's like to be loved by a man. Before a woman falls in A beautiful and refreshing look at life, love, marriage, dating and singleness from the wisdom and experience of a grandmother to the ears of her granddaughter. It's not another one of those modern, jaded books on dating. Really sweet and fun. This book was absolutely refreshing. The family connection is so inspiring in today's world as we always read about strife within families. Gasbarre doesn't point blame at anyone; she simply struggles with relationships and turned to her grandmother as an alternative to today's ways of handling dates and the way guys look at relationships. I could picture this as a movie soon. if hollywood doesn't see the emotional swings this book brings, then they're missing the boat. Good luck to Gasbarre in h This book was absolutely refreshing. The family connection is so inspiring in today's world as we always read about strife within families. Gasbarre doesn't point blame at anyone; she simply struggles with relationships and turned to her grandmother as an alternative to today's ways of handling dates and the way guys look at relationships. This book started off with promise, but it turned into a rather annoying tribute to the writer's grandparents. When she started with some fun dating stories, it was interesting. Then she veered off course and spent 4/5 of the book talking about an annoying doctor who may or may not now be her boyfriend. Can he live up to her perfect grandfather's example of how a gentleman treats a woman? We don't even get to find out. I'm about halfway through this book and I absolutely despise it. A grown woman wrote this book? Her obsession with needing to find a man in order for her life to have some meaning is borderline pathetic. I'm tempted to stop reading it now but I'm holding on to hope that she will redeem herself by the end of her story. *Update: to clarify, I did not finish reading this book. It was that bad. 3 1/2 stars. More poignant than it may have been normally since my grandmother is also recently widowed. I really enjoyed the relationship Krissy cultivated with her Grandma, and all the sound advice she was given. It was maybe a bit too little subject matter for a full book, it would have worked nicely as a blog or magazine article though. Good story, easy enough read but not all that gripping. I didn't feel the desire to keep reading, felt more like a how to guide being explained by friend. Some good advice but lacked the narrative draw I enjoy. Gasbarre moved back home to DuBois, Pennsylvania following the death of her beloved grandfather, the head of her loving family. She was a little lost, professionally and personally. The man she loved moved to Bahrain, and she was losing interest in her job as a nanny in Italy. When Grandpa dies, he left behind a bereft wife. Krissy always admired her grandparents' marriage, and now she had the opportunity to spend time with Grandma and ask her how she and Grandpa made their marriage work. Could G Gasbarre moved back home to DuBois, Pennsylvania following the death of her beloved grandfather, the head of her loving family. She was a little lost, professionally and personally. The man she loved moved to Bahrain, and she was losing interest in her job as a nanny in Italy. When Grandpa dies, he left behind a bereft wife. Krissy always admired her grandparents' marriage, and now she had the opportunity to spend time with Grandma and ask her how she and Grandpa made their marriage work. Could Grandma give her advice that she could use? One thing that Grandma tells her is "if you are really concerned with finding somebody to love then I am telling you that you have to stop focusing on yourself." When Krissy can't believe that her grandma is telling her to put aside her needs for a man, Grandma responds "if you love someone, that's what you do. It comes naturally." "A friend, Krissy. A man needs someone who supports his work. Someone who hugs him and means it when he walks in the door at night. You want to be with a really good man? You have to have courage. And patience. Lots of patience." Grandma's advice borne of years of practice is compelling. Her husband was a successful, charismatic, hardworking, business owner, and it wasn't always easy being married to him. Krissy listened to her grandma's advice and stories and tried to process it. Is this advice still relevant in today's world? Krissy was set-up on a date with a highly eligible oral and facial surgeon, Chris. Chris was handsome, smart and building his practice. Their first date did not go well, and Krissy next ended up dating Tucker, a college student six years her junior. Her relationship with Tucker had its ups and downs, and after a disastrous weekend fishing trip that Gasbarre describes in brutally honest detail, ends badly. I can't imagine there is a woman out there who can't relate to that section of the book. Gasbarre is also honest about her grandma. She is a bit of prickly woman, and I'm glad that Gasbarre resisted the temptation to portray her grandma as a sainted lady. She often tried the patience of her children and Krissy. The life of a widow is tough, and Gasbarre does a masterful job in her description of it. I really felt the ache of Grandma's loneliness, and it is a feeling that many of us who have long, happy marriages will sadly have to face at some point in our lives. The scenes where Krissy and her grandma are the only single ladies in a group of marrieds at parties and family gatherings touches on the loneliness that people can feel lost in a crowd. Gasbarre's writing is wonderful and heartfelt; she chooses the perfect phrase and words, and she balances Grandma's life and advice with her own journey to find her place in the world. The titles of the chapters are Grandma's words of advice- "Know When To Say I Love You" "Support His Work" "Get Your Own Life Settled". If I have any criticism, it is that Gasbarre compares her feelings about her troubled relationships with her grandma's loneliness at losing her husband. I don't think you can compare the loss of a husband of sixty years with the loss of relationship of a few months; there is no comparison. Someday she will realize that. How to Love an American Man has been compared to Eat, Pray, Love, but I find this to be a stronger book. Telling Grandma's story alongside Krissy's search for a loving relationship really touched my heart, and makes it less self-centered, as has been the (justified) knock against Eat, Pray, Love. Here's the problem I found with this book: the description/synopsis makes it sound AWESOME! And then you get into it, and you realize, it's not awesome. It's supposed to be about the lessons Kristine learns from her grandmother, right? And about h Here's the problem I found with this book: the description/synopsis makes it sound AWESOME! And then you get into it, and you realize, it's not awesome. It's supposed to be about the lessons Kristine learns from her grandmother, right? And about her own grandparents' love and their relationship and how it developed. So I was expecting details. Less of "Grandma explained to me why they loved each other." I would have really liked to read actual stories - the Grandma's dialogue was almost nonexistent in this book. I did not think Kristine's relationship with her grandma was super heartwarming. Sure, she drives her grandma around and takes her to lunch. But she appears to be annoyed about it the entire time. At some points she appears to treat her grandma like an inconvenience. I also thought Kristine's relationships with Chris and with Tucker were total crap. Her fling with Tucker seemed gross and unreal to me from the beginning - I didn't understand the attraction there at all. And Chris was a real...jerk. I mean seriously. If a guy treated me like he treated Kristine, I'd have been out of there in a heartbeat. Sure, you have to make allowances for people, but after the 15th date cancellation/bail and the weird avoiding-y stuff, I'd have been done. Kristine's obsession with him was weird. Her family encouraging her to date this weird, selfish, creepy guy was even weirder. Is it love? No, probably not. In the end, nobody finds love. There are no stories, just summaries. There is no resolution, just questions. And apparently the reason for this is that there is going to be a sequel? For heaven's sake, why? If you can't write about it in one book, it doesn't need to be written at all. Wow, this book has gotten a vast range of reviews! I tend to like memoirs in general and this one appealed to me instantly. I feel like the author of the book has been blasted for being immature and childish, which really surprised me. I felt like I was watching Kristine grow up throughout the book. I found her relationship with her grandma endearing and her candid writing engaging. This was an engaging book, and I thought very relatable. It's difficult as a 20-something today trying to find out Wow, this book has gotten a vast range of reviews! I tend to like memoirs in general and this one appealed to me instantly. I feel like the author of the book has been blasted for being immature and childish, which really surprised me. I felt like I was watching Kristine grow up throughout the book. I found her relationship with her grandma endearing and her candid writing engaging. This was an engaging book, and I thought very relatable. It's difficult as a 20-something today trying to find out where you belong and where you want to be. There are so many different roles women can fill today and often the age when a woman comes to terms with herself and her goals comes later than it used to. There are many stages of "coming of age" now, in my honest opinion. Overall, this book really spoke to me. I cried with the family at the loss of a grandfather, sympathized with Kristine as she fought to make relationships work, fell slowly for Chris, and whole heartedly adored her relationship with her grandmother. Yes, the characters overall could have used some more development, but at the same time they were background players. The writing isn't the best I have ever read, but it's far from the worst (50 Shades of Grey, Twilight, I'm looking at you). How to Love an American Man is a fast read, and it made me think. I think it's worth a shot. So I wasn't exactly sure what the story was going to be about, but over all it was good. Kris starts just like a lot of girls I know, who seem to be addicted to being in Love. It was cool how she begins to establish a more "grow-up" relationship with her parents and grandparents. Her grandmother turns out to be what some of us would consider forward thinking, for being so 'Old Fashioned'. When i began, I felt kris was what most young women are these days, somewhat needy, and no direction. What sh So I wasn't exactly sure what the story was going to be about, but over all it was good. When i began, I felt kris was what most young women are these days, somewhat needy, and no direction. What she learns from her Grandmother in the course of just over a year, is that to be successful in your relationship, you should know what your interests, values, and goals are in life. Once you know those, you can then share them with someone who has the same interests. I think grandma's most important lesson to Krissy was that a partner doesn't make your life, he enhances the one you already have. A very good lesson to impart on my girls. I liked this story. Gasbarre's grandfather and grandmother had the perfect marriage and the perfect life. Gasbarre is beginning to think she will never find anyone with whom she can share her life, that she will never have a marriage or a life like that of her grandparents. After a sojourn in Europe and yet another disastrous relationship, she returns home to spend time with her grandmother and listen to her counsel. I had mixed feelings about this book. I got very tired of hearing about the clothing and the jewelr Gasbarre's grandfather and grandmother had the perfect marriage and the perfect life. Gasbarre is beginning to think she will never find anyone with whom she can share her life, that she will never have a marriage or a life like that of her grandparents. After a sojourn in Europe and yet another disastrous relationship, she returns home to spend time with her grandmother and listen to her counsel. I had mixed feelings about this book. I got very tired of hearing about the clothing and the jewelry that Gasbarre wore on her dates. I got very tired of her recitation of the Voice in Her Head that constantly warned her of impending disaster when it came to men. Yet I found her desire to follow in the footsteps of her grandparents quite refreshing in this day and that saved the book for me. Favorite quote: "I teach the world how to treat me by the way I treat myself, and the way I present myself" SO TRUE. I am going to try harder on this! Honestly, the title of this book turned me off at first. Who has the authority to tell me how to love an American Man? BUT WOW. This book was beautiful because it involved a strong relationship between the author and her grandparents. I am a SUCKER for grandparent relationships, as I love my grandparents to death. They are my WORLD. Kristine beaut Favorite quote: "I teach the world how to treat me by the way I treat myself, and the way I present myself" SO TRUE. I am going to try harder on this! Honestly, the title of this book turned me off at first. Who has the authority to tell me how to love an American Man? BUT WOW. This book was beautiful because it involved a strong relationship between the author and her grandparents. I am a SUCKER for grandparent relationships, as I love my grandparents to death. They are my WORLD. Kristine beautifully describes how her grandmother's generation and her own generation clash, and how they learn from each other. Everyone thinks their grandparents are the wisest people on earth, but the grandparents can learn so much from their grandchildren. This memoir had me crying in the first chapter. If you have ever lost a grandparent or been close with one, this book will definitely touch on those feelings. A delightful read as Gasbarre takes us on her journey of finding love with the help and influence from her grandma after her grandpa (and rock of the family) has passed after 60+ years of marriage. If anything, this book will make you want to call your grandma(s), as she/they truly are wise and inspirational when it comes to love.